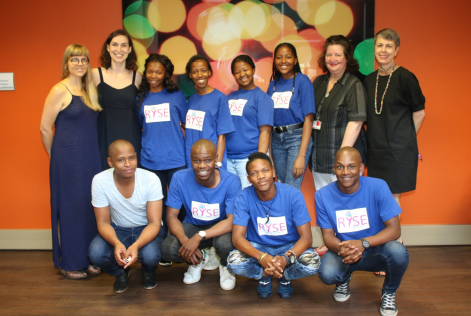 The Resilient Youth in Stressed Environments (RYSE) study is a cutting-edge, funded study that ist taking place in Canada and South Africa. In South Africa, RYSE is supported by a community-based panel that includes adolescents (aged 18 to 24) who live in eMbalenhle. 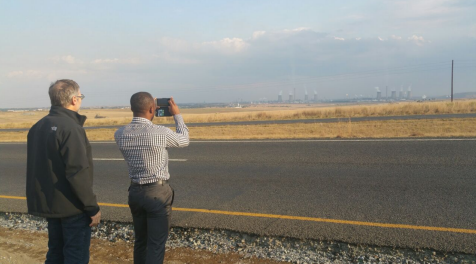 eMbalenhle and Secunda are the primary South African RYSE research sites. Since the 2017 inception of the RYSE study, this panel has expertly advised the researchers on the study’s aims and methodology, and actively recruited 600 participants for RYSE research activities (including arts-based qualitative work, a survey, collection of hair samples, and citizen science). The panel has also vetted the findings resulting from the study. To this end, Mr Mthokozisi Mabuza Ms Mamello Motinya, Ms Witness Moya, Ms Thandiwe Mtengwane, Mr Thulani Ncongwane, and Mr Simphiwe Zulu visited the Groenkloof Campus on 12 October to meet with four of the Educational Psychology masters students working in the RYSE study (Mrs Marianne Blunden; Ms Katherine Malakou; Ms Mariaan Prins; Mr Mthandeki Zhange). The students presented their findings relating to the resilience of adolescents from eMbalenhle and the panel commented critically on how well/not the findings resonated with their everyday experience of life in eMbalenhle. The panel provided invaluable input into what the research team is learning about the complexities of adolescent resilience in the face of chronic, multi-level adversity. 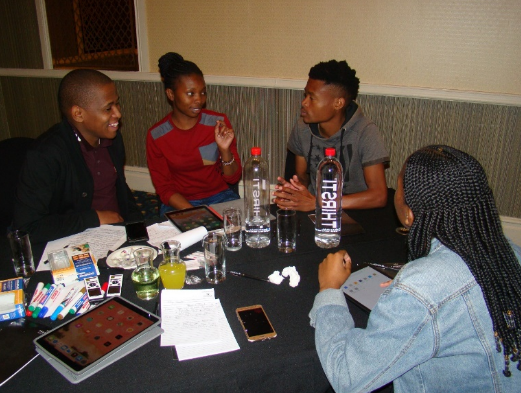 The panel and UP-based researchers will co-disseminate the emerging finds to the eMbalenhle adolescents who participated in the 2018 survey during community-based workshops that will held at the eMbalenhle SASOL club in December. 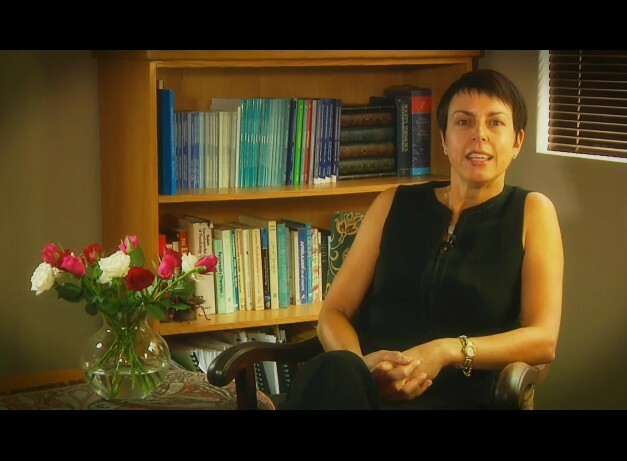 Together with Dr Diane Levine (University of Leicester, UK), Prof Linda Theron was awarded a British Academy Newton Mobility grant to explore how digital story methods might advance adolescents’ capacity to give voice, as it were, to what enables resilience in the midst of apparently intractable adversities such as poverty, violence, loss, and environmental degradation. 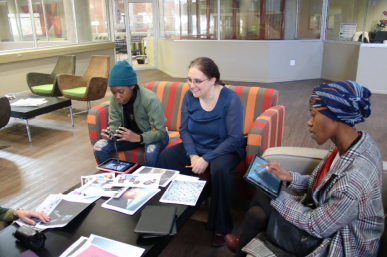 Linda and Di recruited collaborators from the University of Pretoria (Ms Mosna Khaile, RYSE project staff; Ms Katlego Nchoe, Department of Educational Psychology; Bongiwe Ncube, Educational Psychology masters student; and Mr Mthandekik Zhange, Educational Psychology masters student). Linda and Di trained these collaborators to facilitate digital stories. The team then visited the RYSE project site (eMbalenhle, Mpumalanga) twice (20 July and 5 October) to work with 19 adolescents between the ages of 18 and 24. On the first occasion they supported these adolescents to tell stories of risk and resilience and then to co-create a group story of risk and resilience. Each group digitized their story using the digital story software. On the second occasion, each adolescent used digital story software to digitise a personal story of risk and resilience. The adolescents viewed one another’s stories and loudly applauded how the powerful stories portrayed the stark realities of endlessly difficult lives along with the personal and relational capacities that made it possible to triumph over these difficulties. The October wind blew in with a lot of goods to our shores. Firstly, we received the transcriptions of all the data collected for activities 1 and 2, which are now being coded and analyzed. Secondly, our partners from University of Brighton and Boing Boing Resilience Research and Practice ( http://www.boingboing.org.uk/) were in town to wrap up their project on resilience and drought (Patterns of resilience among young people in a community affected by drought: Historical and contextual perspectives) and to coordinate a Think Tank initiative involving the youth from the community (Leandra, Mpumalanga) and the RYSE team. 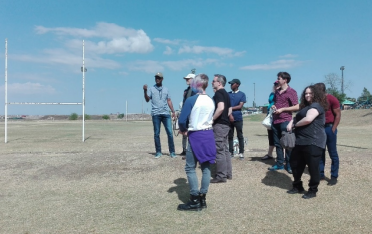 Finally, we received members of the RYSE team from Canada, Dr. Michael Ungar (Principal Investigator) and Eric Twum-Antwi (Project Manager) for a productive week that involved visits to Embalenhle, the research site in Secunda and meetings with the advisory panel, youth from the site, and the research team in South Africa. On our tour through Embalenhle, the young people from the advisory panel, led us through their community, gave us a glimpse of their world and what it meant to be resilient, or, in their own words: “ ‘Rysing’ in the face of adversity”. Right after the tour, we had the opportunity to sit with the entire advisory panel for RYSE South Africa to introduce to them the Canadian partners, update them on the progress of the project at the Secunda site and the Canadian sites, discuss the next steps forward and finally to share ideas on the best way to reach out to the youth in the community and to share results on the local and national level. Bottom photo, back row: Simphiwe Zulu, Tiisetso Makhafola, Eric Twum-Antwi. 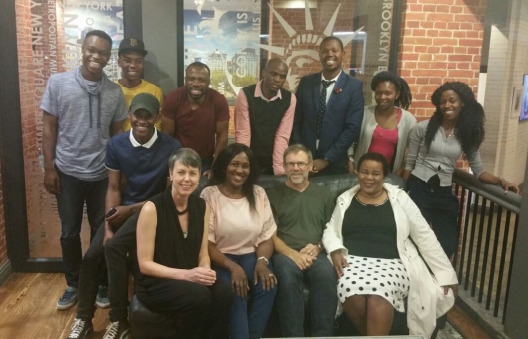 Academics and students from the Department of Educational Psychology are collaborating with academics from the University of Brighton in a project (funded by the Natural Environment Research Council or NERC) to better understand the resilience of South African young people challenged by drought. 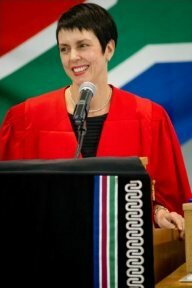 The project, which ends in October 2017, is led by Prof Angie Hart (School of Health Sciences; University of Brighton, UK) with strong support from a UK research team and a South African research team (including researchers from the Universities of Pretoria, Cape Town and Johannesburg). 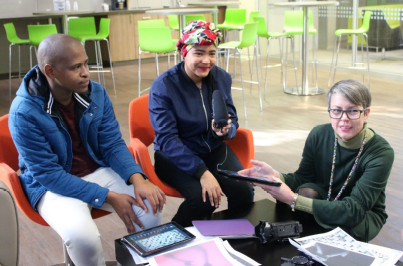 The UP team comprises Prof Linda Theron and Prof Liesel Ebersöhn (both from the Center for the Study of Resilience and the Department of Educational Psychology) who are co-applicants in the project. Dr Motlalepule Mampane (Department of Educational Psychology) is a collaborator in the project and Mosna Khaile is the project manager. 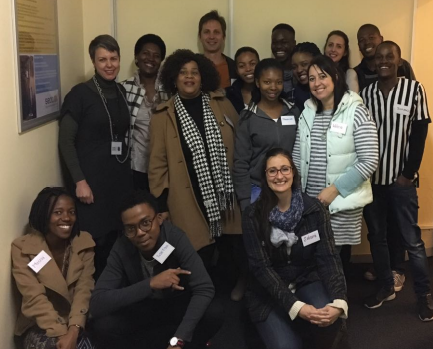 Together with eight educational psychology masters students and seven education honours students, these UP academics spent 4-5 April and 23-24 June learning from young people in Leandra about their experiences of drought and resilience, and what their elders know about drought and resilience. The team has relied on arts-based methods that facilitate co-produced research results. They plan to return to Leandra in October 2017 to show the community what the young people of Leandra can teach South Africa about resilience in times of drought. 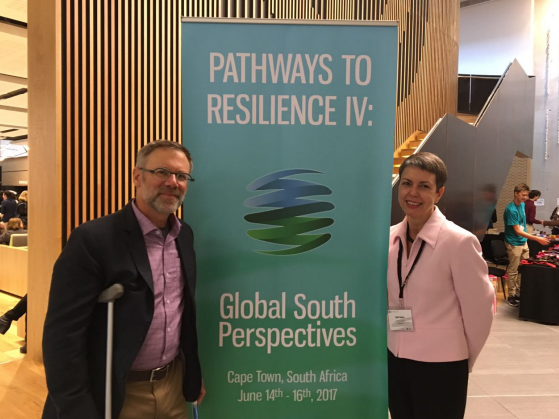 Professor Linda Theron (Department of Educational Psychology & Center for the Study of Resilience) and Professor Michael Ungar (Canada Research Chair in Child, Family and Community Resilience; Director, Resilience Research Centre, Dalhousie University, Canada) co-hosted the fourth Pathways to Resilience Conference in Cape Town from 14-16 June 2017. Pathways to Resilience IV was the first Pathways conference to be held outside of Halifax, Canada. It was attended by 370 delegates from 54 countries. 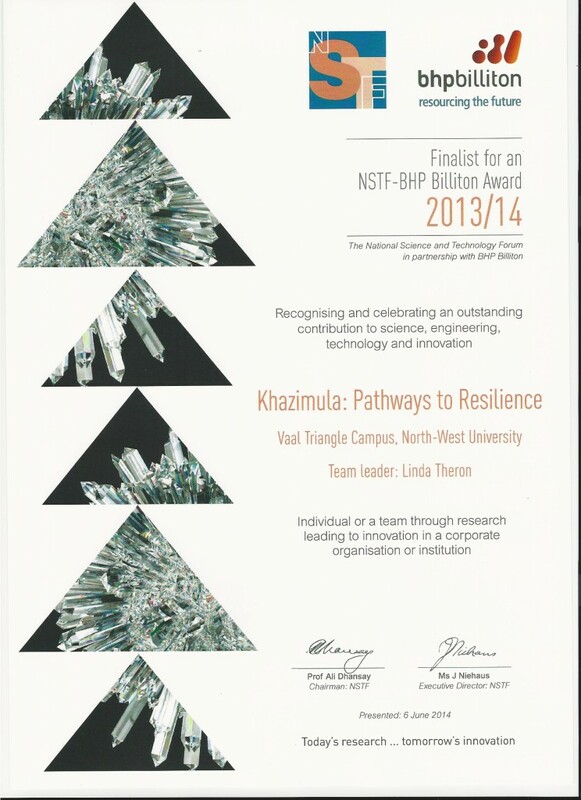 The theme of Pathways to Resilience IV was on Global South perspectives of resilience. Expanding the resilience discourse first started by the Resilience Research Centre (Dalhousie University, Canada) to the Global South was long overdue, not least because the people of the Global South are so often disproportionately challenged by double and triple jeopardies (e.g., being marginalised and knowing survival-threatening challenges such as climate change and/or armed conflict and/or structural inequality). In the face of the apparently intractable challenges to human wellbeing, knowledge of how and why individuals, families and communities adjust well to adversity is unquestionably important. In particular, understanding how positive adjustment aligns with contextual realities and cultural expectations, and how these vary across and within diverse Global North and South contexts, means that health and wellbeing can be meaningfully supported. Ultimately, optimised individual, family and community functioning is the agenda of resilience research. Undoubtedly in comparing Global South and North accounts of resilience and using subsequent insights to inform meaningful facilitation of resilience, Pathways to Resilience IV advanced this agenda. On the 25th of July 2017, the research team had a meeting with the local advisory panel. A member of the Community Advisory Panel (CAP) organised a venue for this meeting which was more easily accessible via public transport for adult and youth committee members. Five youth and five adult CAP members attended the meeting. They were enthusiastic about RYSE and committed to working with the academics for the next five years. The adult CAP members included community members from an NGO called Inqubekelaphambili (which translates as “to continue forward”), the National Youth Development Agency and Khulisa Social Solutions. Inqubekelaphambili is a Non Profit Organisation that works to provide disadvantaged young women in schools with sanitary towels. The National Youth development Agency is a government based company that helps youth by providing information, career guidance, mentorship and supporting the development of entrepreneurial skills. 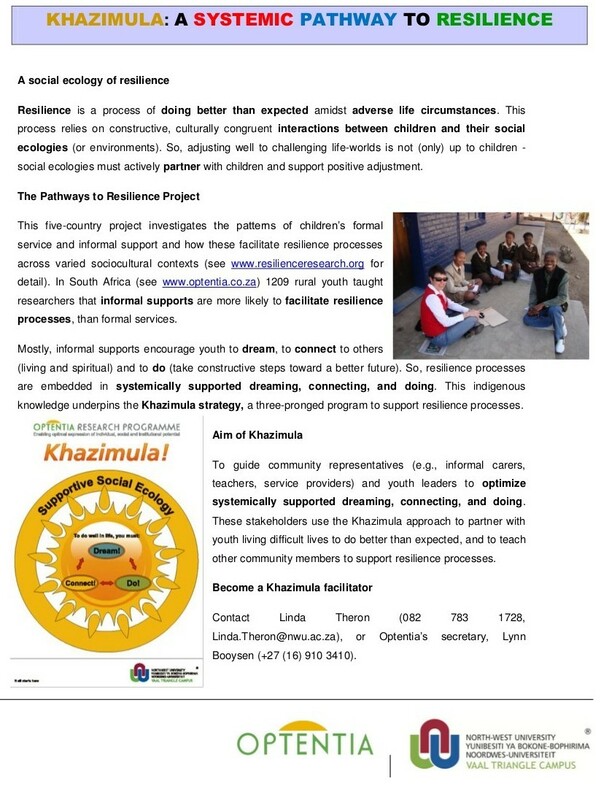 Khulisa Social Solutions, a NGO, is a community partner to the RYSE project. Khulisa worked closely with Linda Theron in the Pathways to Resilience project (2009-2014) and work particularly supportive in the knowledge mobilisation activities. The youth CAP members represent the Embalenhle Youth Committee. Embalenhle (which translates as “beautiful flower”) is a township situated in the greater Secunda area. The first houses that were constructed in the township of Embalenhle were built by SASOL in 1970 as a dwelling place for black employees. Now, this township is a home to many locals and migrants and has a population of 118 889. The CAP would like to see RYSE focus on youth living in Embalenhle. 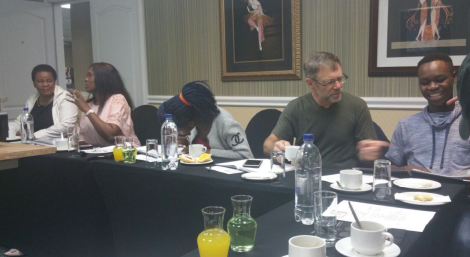 The CAP members have agreed to assist with the recruitment of youth for the qualitative data collection phase. Data collection will commence in Embalenhle on 26 August 2017. Linda Theron was invited to deliver a congress address at the recent 3rd World Congress of Resilience held in Trois Riviere, Quebec, Canada (August 2016). As with her other work, this address drew attention to how traditionally African ways of being, and the expectations associated with this, shape how sub-Saharan African young people accommodate the perennial challenges of structural violence. She introduced cutting-edge insight into how cultural heritage is differentially meaningful, depending on the risks young people experience and contextual variables. Linda emphasized that leveraging relevant cultural heritage to support young people to beat the odds is important, but that it is equally important that social ecologies take action to change the odds that continue to challenge the wellbeing of young people in sub-Saharan Africa. The other invited addresses were made by Boris Cyrulnik, Serban Ionescu, Laurence Kirmayer, Rachel Thibeault, Michael Ungar, Adrian van Breda, and Lisa Wexler. ‘Waithood’ is Alcinda Honwana’s interpretation of what young people experience when inequitable social systems disrupt their attainment of social adulthood. An increasingly popular youth response to such limbo, particularly in Africa, is public protest and subversion. But, under what circumstances does such social agency nurture sustained resilience? Do young people’s responses possibly include alternate actions, strategies, or visions, and how might these enable or constrain resilience processes? Perhaps more importantly, what role do social ecologies play in all of this? 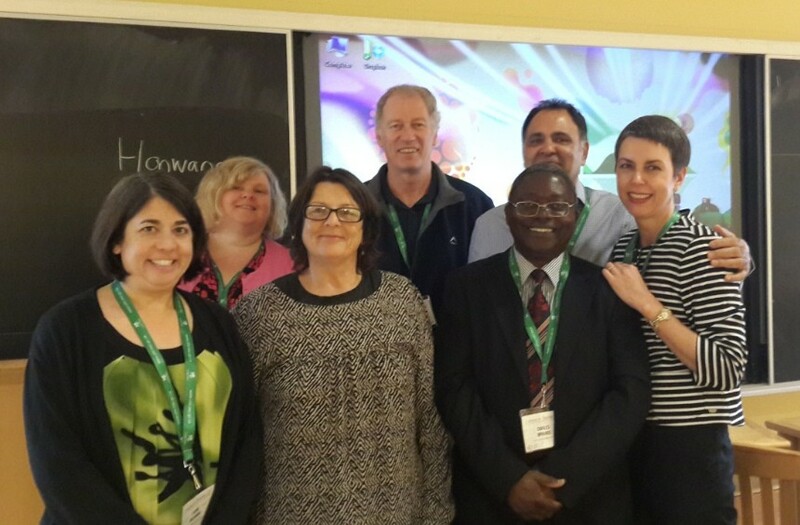 This multi-country plenary-panel (Linda Theron [chair], Arvin Bhana, Dorothy Bottrell, Angie Hart, Lali McCubbin, Charles Mphande, and Steve Reid) showcased six case studies of ‘waithood’. They foreground African, Native Hawaiian and UK-based young people whose life-worlds impose ‘waithood’. Some are constrained by immigrant status, race/ethnicity, disability, and/or disadvantage; others are hamstrung by megalomaniac governments, compulsory community service, or premature fatherhood. The panel revealed the complex variability of young people’s responses, ranging from a ‘no waiting’ activism, to stoically ‘doing what they must’ and developing grit, to giving up. Each case flagged that young people are not lone actors in their responses – social ecologies are co-actors, and not always in ways that sustain resilience. Taken as a collective, these cases signal that resilience-supporting responses to ‘waithood’ demand constructive systemic inputs – including collaborations with young people to overhaul life-worlds that threaten resilience. Drawing on the findings of two multi-country resilience studies (Pathways to Resilience Study; SISU study), this symposium interrogated how psychologists can support resilience processes among South African children who are placed at risk by South African society for negative life outcomes. Ungar’s (2011) Social Ecology of Resilience Theory was the symposium’s departure point. Meaningful psychological support demands that psychologists acquire deep knowledge of the varied nature of resilience resources, and how these are systemically shaped by contextual and cultural factors. Accordingly, resilience is conceptualized as a process in which children and their social ecologies collaborate toward functional outcomes amidst adversity. The symposium comprised three parts. First, Linda Theron (principal South African investigator in Pathways and SISU) provided a synopsis of the projects and comment critically on the pressing need for culturally- and contextually-sensitive understandings of resilience as a systemic process. She highlighted the need to change the odds that challenge young people, rather than expect young people to beat the odds. Part Two contained four papers. Paper 1 (Theron & van Rensburg) reported Pathways survey findings to flag how mental health risk is differentially associated with resilience-supporting resources when youth consider their communities safe/unsafe, and that quality caregiving (but not caregiver presence) moderates this relationship. 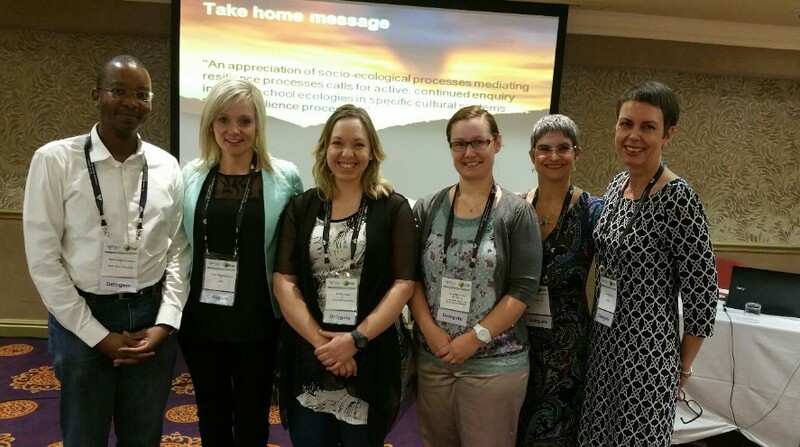 Paper 2 (Bezuidenhout) reported SISU findings that illuminate how important school ecologies are to Gr. 1 children’s resilience processes, and what this implies for educational psychologists. Paper 3 (Kahl) drew on the same study, but compared South African and Finnish findings to highlight how context influences the expression of resilience-supporting processes. Paper 4 (Khumalo et al.) reflected on the meaningfulness of a creative repertoire of qualitative methodologies, and multiple social ecological voices, to elicit deep and trustworthy understandings of children’s resilience processes. 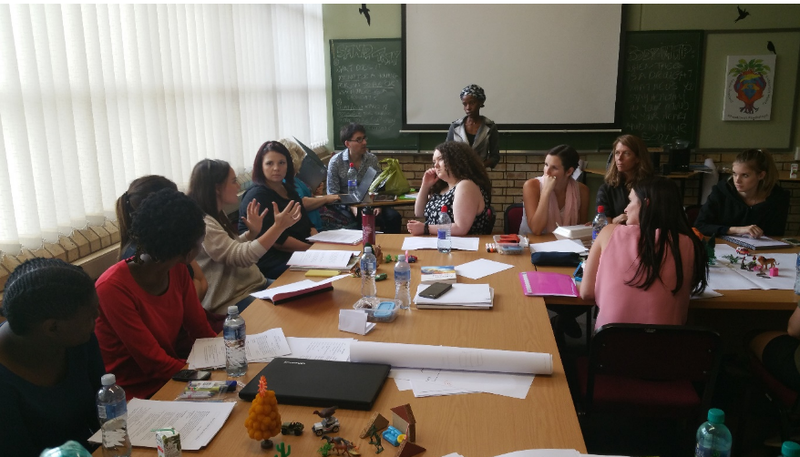 Part Three was facilitated by Dr Elzette Fritz (a practising educational psychologist and creative arts therapist) who acted as discussant and stimulated a critical dialogue about the usefulness of resilience research findings to psychological practice and the need to do research in context-/participant-appropriate ways. Copyright © 2012 Linda Theron. All Rights Reserved.